I've never eaten a Waldorf Salad but if it's anything like Emeril's Turkey Waldorf Sandwich in his new book Kicked Up Sandwiches I'd love to try it. Emeril uses fresh roasted turkey breast, crisp sliced apples and a creamy dressing mixture of mayo, yogurt and pecans to make this sandwich extra delicious. I can however give you the Turkey Waldorf Sandwich Recipe. Oh and I almost forgot to mention...this makes great leftovers. 2. Season the turkey breast on all sides with 2 teaspoons of the salt and 1/2 teaspoon of the pepper. Place the turkey in a small roasting pan or on a baking sheet, and roast for 30 minutes. Then brush the turkey with 2 tablespoons of the olive oil and continue to roast for another 30 minutes, or until the thickest section registers an internal temperature of 165°F on an instant-read thermometer. Remove the pan from the oven and loosely tent it with aluminum foil. Let the turkey rest for at least 15 to 20 minutes. Once the turkey has rested, remove the breast bone and cut the turkey into thin slices. Set aside on a platter. 3. To make the Waldorf dressing, in a medium bowl, combine the chopped pecans with the 1/2 cup yogurt, the 1/4 cup mayonnaise, the parsley, and the vinegar. Season with 1/2 teaspoon salt and 1/4 teaspoon pepper. 4. Halve and core the apple; then cut it into thin slices on a mandolin. In a medium bowl, toss the apple slices with the lemon juice, celery, and cherries. Then add the dressing and toss. 5. In a small bowl, combine the remaining 2 tablespoons olive oil, 2 tablespoons yogurt, 2 tablespoons mayonnaise, 1/4 teaspoon salt, and 1/4 teaspoon pepper. Mix well. 6. To assemble: Place 4 slices of the toast on a clean work surface. Spread 1 tablespoon of the yogurt-mayonnaise mixture on each slice of toast. Top each one with lettuce leaves, several slices of turkey, 3/4 cup of the apple salad, and 1/4 cup of the sprouts. Top with the remaining slices of toast. Cut each sandwich in half, and serve immediately. Want to win a copy of Kicked Up Sandwiches? Here's all you have to do. Leave a comment on this post tell me what your favorite sandwich is. I will randomly pick a winner on Oct. 16th. I have two favorite sandwiches. The first is my comfort sandwich, which I've loved since I was a kid. It's simple: German bologna and American cheese on white bread. My second is my adult favorite: grilled chicken, roasted red peppers, and fresh mozzarella. I followed Emeril on FB. I followed Morrow Cookbooks on FB. I love tuna sandwiches with Red onion, my husbands grilled cheese and pretty much any other sandwich such as tomato and mozzarella with fresh basil. Followed all three! And my favorite sandwich is a delicious Philly cheesesteak. Wit Whiz!!! Yum, this sandwich looks great :) I love turkey and apples together. 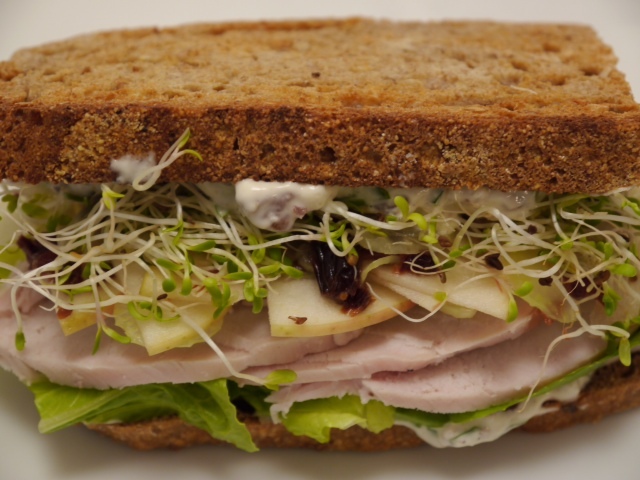 I love sandwiches with turkey and sprouts. Adding dried cherries and apples would make it extra good! My favorite sandwich is probably a club. I have memories of my Dad making them for dinner on Sunday night - I was so impressed by the triple decker effect! I love Grilled Cheese with Tomato. This looks like such a fantastic sandwich! My favorite sandwich is a bacon, spinach, tomato, and avocado. My favorite sandwich is chicken salad or... Mediterranean veggie sandwiches with hummus, pesto, bell pepper, avocado, tomato, and feta. YUM. I follow Emeril on fb! My favorite sandwich is a Baked Italian totally loaded with lettuce, tomatoes, onions,oregano, spicy mayo and Hot Peppers! I Follow you on Facebook and left a comment. I follow Emeril on Facebook and left a comment. I Follow Morrow Cookbooks on Facebook and commented.